Chinese Astrology is a celebrated system used for thousands of years helping guide people towards success through more informed decision making. Here, I will explain what drew me to Chinese Astrology, focused my attention to master the art form, and travel around the world with the artwork I created from my studies. I will be teaching a class on Chinese Astrology at Spectra Art Space (1836 S Broadway, Denver CO), Sat Mar 2 1-3p. We will learn our lunar, month, and hour signs then create a collage of the traits from the reading. Tickets can be found here: https://www.eventbrite.com/e/learning-the-chinese-zodiac-tickets-55266053253. I began by reading Theodora Lau’s the Handbook of Chinese Horoscope. Lau is a gifted teacher and illuminated the truly magical connections between each zodiac sign and their real world equivalent. The synchronicity and beauty of the system combine to create traits that harmonize in cycles of 12 and 4. Each year, month, and hour have specific energies recognized by the system of Chinese Astrology which harmonize with Chinese Medicine and a person’s health. There is an element for every two years beginning with years ending in 0 and 1 are metal, then water, wood, fire, earth for years 8 and 9. My latest series which premiered on tour through Australia in Nov 2018: The Chinese Zodiac Four Element Series takes a deeper look into the elemental nature of the zodiac and the harmonious combinations of Fire, Earth, Wind, and Water. Through my studies, I began to see trends and connections which made my vision clearer and inspired me to begin memorizing Lau’s book. Over several months in the summer and fall of 2017, I memorized Theodora Lau’s Handbook of Chinese Horoscope cover to cover. I practiced the system and used it regularly to memorize what I was learning. Repetition makes it real. For example: I was born year of the Earth Dragon, associated with the sign of Aries is a powerful and strong visionary made consistent and a pillar of her community by way of the earth element. Next, I was born in the month of the Rabbit associated with the sign of Pisces to be creative, sweet, and ubiquitous. Finally, I was born in the hour of the Dog associated with the sign of Libra and the sign of balance, service, and honesty. Dragon and dog are opposite but when combined they form a bridge between East, Dragon, and West, Dog. Honestly, I dove so deeply into Chinese and Western Astrology to achieve a deeper look as to who I am and the world I create given the decision making abilities of my signs. The system gives me access to the flow we all know is the right way to go. I am excited to teach “Learning the Chinese Zodiac” class on Mar 2 at Spectra Art Space. This class provides a general comprehension of the 12 sign Chinese Zodiac: rat, ox, tiger, rabbit, dragon, snake, horse, sheep, monkey, rooster, dog, and pig. Each student will receive a reading according to their astrological sign calculated by the birth year and month. Using the information from the reading, we will create collages of the traits of each student’s sign. As common as astrology may seem, it is a skill and art to read each system. Astrology is part of nearly every culture because people have always sought to bridge the earth and stars. As a young girl, my mother taught me to make tamales and read the stars. Our conversations developed into who we are, strong women and builders who navigated our journey according to our lucky stars. As the ups and downs of the waves of life distracted and confused us, we learned to surf and grow better than our previous selves. Life is meant to be enjoyed. The Chinese Zodiac 4 Elements Series is Grace Noel Art’s latest series inspired by the accessibility and usability of Chinese Astrology to help female entrepreneurs grow their businesses as Grace and her mom did. Thus empowering native chicana women to achieve their dreams and rise above life’s challenges. The Chinese Zodiac 4 Element Series had its international premier in November 2018. The originals premiered at RAW Ovation and then toured Brisbane, Perth, Sydney, and Melbourne Australia with RAW Australia Oasis for four weeks. Thanks to this series, I completed hundreds of readings for art patrons world wide and have grown to be an international artist with a presence on both coasts of the United States, Canada, and Australia. The universe is where it all begins, literally and artistically. I am inspired by the stars, and always has been. The stars brought the family together, as I learned astrology from my mom who would talk endlessly about Western and Chinese astrology. At a very young age mom taught me the different constellations and planets looking into the indigo night sky. Mom knew the magic of the stars from constellations, astrology, identifying planets, and the old Chicana folk stories. They all flowed together like the electric yellow Milky Way. The stars have always been a place of magical traditions where anything is truly possible. Space: the final frontier and unknown, gives way to science fiction and stories of heavenly beings. The only other place similar in vastness is the ocean, which has less recorded knowledge than that of space. Similarly, the ocean births beings of light where not thought possible. The vastness of space is where dreams come true. The stars enchanted me as a child and they still do. The vision behind Grace Noel’s artwork is the human connection to something larger than ourselves in our fundamental connection to the universe and stars. The mission of Grace’s Artwork is to express that we are all made of sunshine, sunshine makes the plants grow, the water flow, and the wind blow, so now it is time to go on a magical journey through the rainbow. Grace is a born and raised native Coloradoan whose family dates back farther than pioneer days. She is the niece of legendary Professor of Colorado History, Tom Noel, Ph.D: Dr. Colorado. Now, Grace turns sunshine into star signs with the Chinese Zodiac 4 Elements. Grace has been learning Chinese Astrology alongside western solar astrology her whole life as it was part of regular astrology lessons with mom. This 4 painting series combines the fire, earth, wind, and water groupings of 3 signs (trines) to complete 12 signs. Grace explains she likes Chinese Astrology for its ease of usability, relatability, and depth of inspiration. Anyone who meets Grace knows she is an expert Chinese Astrology and she always wants to know your birth day! “Birthdays are so special and significant, because they make a very special moment in a person’s life,” Grace says, as she explains her interest in astrology. My vision for this series it to celebrate the magic of life with the Chinese Zodiac 4 Elements. Discover your star sign and and let it shine like the sun. On Nov 18, we set out for a rock that rose from the earth as a bridge to ancestral realms. Uluru was a 5 hour car ride through the Australian Outback. This adventure had been a dream of mine since I was young and first learned of the sacred site. Much of the road trip was through remote ranch land with cattle, desert shrubs, dried creek beds, and puffy titanium white clouds for miles. The car ride grew hot as the Australian center reached 30 degree Celcius in mid November 2018. The extreme environment and remoteness kept towns to a minimum however truck stops, known as road houses, offered everything from snacks tourist gifts and gasoline, to camel rides and accomodations. Every road house we stopped at along the way had a farm with emus, camels, and stock, classically Australian. All sorts of travelers caravaning around the desert stopping at each oasis. HWY 87 connects Darwin (north) to Adelaide (south), and coast to coast. Along our road trip, we saw the other landmarks surrounding Uluru. The first prominent feature was Mt. Collins which fooled all of us into thinking it was Uluru. Uncle Ned and I kept our minds occupied betting nickels and dimes on various math games gauging distances and applying the conversions from imperial to metric measurements. Mom got into the games too so we ended up passing nickels and dimes around the car until we reached our destination. We checked into the Emu Walk Apartments at the Ayers Rock Resort. You can imagine this being the only resource in hundreds of kilometers of the Australian bush, its incredible the Aboriginal people found a way to survive and thrive in the Australian Outback for many generations. Uluru (Ayers Rock) is on Aboriginal land and owned by the Aboriginal people. The resort offers artist in residence programs to continue the cultural celebration of the monolith and magical mystical desert landscape. It is tradition to respect Uluru as a sacred site and feel the spirit of the place. This spirit speaks soothingly during dawn and dusk when the monolith glows a vibrant red for 15 minutes. We watched the rock change from orange, to vibrant desert rose, then deep burnt sienna red and finally purple with a desert backdrop, while a deep blue night sky curtain fell trimmed by a vibrant ocher horizon eager for the coolness of night. Visiting the site and learning the ways of the aborigines was beyond magical. I felt connected to the land and culture on a deep level, I felt nothing other than humbled and grateful for the experience. As I learned the way of life of the native people, I was amazed how similar it was to the native ancestors of Colorado, North America, and the Pacific. The roles of men and women, tools used, stories told, all had a familiar to my own family. Of course, we are all made of sunshine. Sunshine makes the plants grow, the water flow, and the wind blow. Now it is time to go, on a magical journey through the rainbow. I have been amazed by the similarities and differences on the adventure. There seems to be a foundation for life to root and as it grows, the rainbow of diversity unfolds to sustain and provide a platform for the cycle to reside. Point of reflection: Balance maintains the exchange of energy and growth providing boundaries, highs and lows while focus provides longevity. This beauty is cosmic yet common, and that’s what makes life extraordinary. The soundtrack for the morning of Nov 19, was Bob Marley’s Legend to celebrate the world and all its beauty. The beauty of family and unity through love provides the endurance to experience the wonders of our elegant Earth. We burned the candle at both ends, waking up in the early morning sweet dew desert perfume and enjoyed the sunrise on Uluru’s east face. A lavish buffet for breakfast and then back to take a closer marvel at the cave paintings of the ancestors on the delicate sacred sandstone of Uluru. We took a short walk to a watering hole at the base of a waterfall that flows from the top of Uluru during heavy rains. Dry water lines were marked by a black iron oxide stripe flowing from above to a pool were saw crustaceans swimming and doing daily chores in their exotic home. These creatures looked like scorpions and must be ancient ancestors given their isolation and unique habitat. “Wherever you walk around Mutitjulu Waterhole you are surrounded by the presence of two ancestral beings - Kuniya the woma python woman and Liru the poisonous snake man. Minyma Kuniya the woma python woman came from the east near Erldunda. A bad feeling grew in her stomach - something was wrong. She had to go to Uluru. Kuniya created inma (ceremony) to connect her eggs together. She carries them to Uluru in a ring around her neck and placed them in Kuniya Piti. Meanwhile, Kuniya’s nephew arrived on the other side of Uluru. He was being chased by a war party of Liru (poisonous snake) men from near Kata Tjuta. He had broken the law in their land and they were sent to punish him. The Liru men threw spears at Kuniya’s nephew. One pierced his thigh and many others hit the side of Uluru. One Liru warrior, Wati Liru, was left to care for the injured python man. But he did not do his duty and left the injured man on his own. Minyma Kuniya realized that her nephew had been injured and was not being cared for properly. She raced to Mutitjulu Waterhole and saw Wati Liru high up on the cliff. She called out to him about her nephew, but he only laughed. Minyma Kuniya placed her wana (digging stick) upright in the ground in front of her. Kneeling down, she picked up handfuls of sand and threw it over her body singing and making herself stronger. She was creating inma (ceremony) to help her confront Wati Liru. Kuniya moved towards Liru singing and dancing akuta - a dance step used by women ready to fight. Kuniya hit him once over the head with he wana. He fell down but got back up. She hit him a second time and killed him. Kuniya then went and found her injured nephew. She picked him up and dusted him off and carried him to Mutitjulu Waterhole. She created inma and combined their two spirits into one. They became Wanampi, the rainbow serpent, who lives and protects the waterhole today. In less than 24 hours at Uluru, we had to turned around and go back to Alice Springs. Nothing other than poor planning contributed to such a short stay. 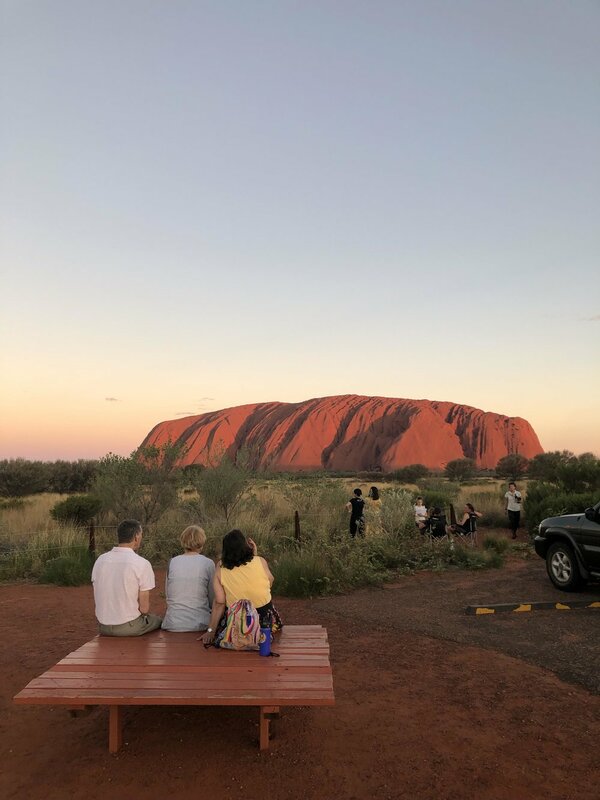 For next time, a direct flight to Uluru would provide more time at the monument, Retracing our steps on the car ride home we grew closer telling jokes, conversation and taking care of one another on a 6 hour car ride. We stayed one more night at the Desert Palms hotel which had a lovely swimming pool to escape the heat. Reflecting on the three day journey through the outback, the local culture of Alice Springs, roadhouses, and Uluru brought a unique perspective to the Australian experience. The next morning, Nov 20, Mom and I flew to Perth. We stayed at the Indian Ocean Hotel, a place mom had romanticized over for months. She liked the rosewood in the photo of the lobby. The Indian Ocean Hotel was in Scarborough, a seaside town with a hip sister city called Fremantle. These towns served as ports for trade in the Indian Ocean and had long sandy beaches with waves great for getting back to surfing. Unfortunately, the spring time winds encouraged us to explore the surrounding areas more than the beach, the water was too choppy for any rides or paddling out. We explored Scarborough and Fremantle where we made friends with Jason and Jessie. We were grateful to have their local prospective and they showed us around Perth and Fremantle. Our last full day in Scarborough, mom treated me to a two hour surfboard rental at Scarborough beach. I surfed the full time because it had been two years since I had been surfing and I wanted to make the most of a beautiful day and waves. Truthfully this tour was inspired by a dream of doing a surf tour in Australia and seeing my family. I enjoyed tumbling in the beginner sized ways and sandy beach with no sharks and the perfect Hurly 3 ml wetsuit. The morning of Nov 22, mom and I moved to the Hyatt Regency Hotel in Perth CBD (Central Business District). That afternoon, we installed for the RAW Oasis showcase at the Rosemount Hotel. To my suprise, I met Kristen Wehlow, RAW’s producer who helped organize Grace Noel Art’s Australian Art Tour. I was so excited to meet her in person and Perth’s showcase was a blast. Perth has amazing artists who impressed me with their talent and the guests were hot for the Chinese Zodiac and Dakota limited edition leggings. I will remember the Rosemount Hotel as one of my favorite venues of the world. First, there was free WiFi, crucial while traveling in a foreign country, there as food, an outdoor patio, and coves with beaded curtains to play video games, eat snacks, and chill. The art patrons of Perth were generous and encouraging of my artwork. Perth felt like the a version of Boulder the Southern Hemisphere, again it felt like home. Thank you to Barry Anderson and family for your sponsorship of Grace Noel Art’s Australian Art Tour! The next morning, Mom and I shared our last breakfast before sending her to the airport. This is the point in the tour when we split ways and mom went to visit my cousin Julia and her husband in Melbourne before flying to the USA on Nov 25. Mom was so happy to be on holiday and relax in the wonderful Australian Spring weather. Together we saw things we could only image and read about. She was an excellent helper at shows, finding “S” hooks in Brisbane and taking enormous pride in her daughter’s hard work helped with sales. I think a number of you can relate, November 2017 was the beginning of some intense times! A number of us took some big losses and now that it is Sept 2018, we are realizing those losses, as painful as they were, needed to happen. We are freer and more expansive so long as we survived the transition. In November 2017, I was living at the Denver Art Society working as the Interim Executive director and building my reputation as an artist. I had a successful night at Pancakes and Booze and was applying for more showcases and exhibition spaces. I hadn’t been in a salon for nearly 15 years, I figured I’d cut my own hair to save money and since swimming was my main sport throughout high school and college there was no reason to dye my hair. However, during the summer of 2017, I began getting my eyebrows waxed for the first time; I figured I was a professional and needed to look more the part. My Hair Trip Salon has been across the street as long as I have been at the Denver Art Society. It is an all organic and waste conscious salon, my kind of place. The stylists, artists, and body workers who create there are so positive, supportive, and uplifting, it’s a true gem of the Art District on Santa Fe Drive. In December, I made it into the salon to keep up with my eyebrow shaping treatments and inquired about exhibition times. They display artwork for three months at a time. I inquired about availability and Kyle signed me up for March-June 2018. I was excited and felt there was something special to the space. As the year came to a close, the Denver Art Society Board of Directors demoted me, slandered me, and harassed me well into March 2018. Heartbroken and devastated, I tried to fix the situation the best I could filing an incident report against the President of the Board and the coop members who were attacking me. Denver Art Society was my home, my reputation, my work place. I knew all our neighbors and LOVED living there. Others members were being treated unfairly like I was so we all did our best to hold our ground. Ultimately, it was one of those situations where I knew I was fighting a losing battle. Once I realized this, I gave it all up, resigned and moved out. I almost relocated my studio during this time but my reputation preceded me and I didn’t want to lose touch with my studio, its location, and reputation. I had seen these political melt downs happen before at Denver Art Society and rarely saw the members who were effected by it afterwards. While I was holding onto my studio and dealing with persistent harassment from the admin of the Denver Art Society, I was even more energized to look for new exhibition spaces. My Hair Trip Salon was one of these spaces; I was able to be in a positive environment and regain the confidence that had been harassed and slandered out of me. Thankfully, when my show went up in March, it was well received, I sold a piece the first week! I received such a warm welcome and lots of compliments. The owner, Nichol Zamora, really liked a painting that I hung in her studio. We cherished the painting, Space Whales, together adoring the little doggies with scuba gear, a kind of hidden detail. During such a challenging time, the positive environment of My Hair Trip Salon and everyone’s admiration for my art, put wind in my sails to continue making art and promoting myself in Denver. Over the three months my artwork rotated through the salon, I continued to build a relationship with the stylists there. I decided to get my hair cut for the first time in 15 years! Melissa did a great job honing in on my hair style, providing me an edge I never would have tried on my own. By June and the end of my exhibition, Nicole offered me to be her model for the salon photo shoot in June. Humbled and honored, I accepted without question. She also offered me the option to trade the painting Space Whales for hair styling. Again, I was humbled and honored, and accepted without question. I have found such support in the Art District on Santa Fe. During those traumatic times, the Art District offered me a seat on their Board of Directors regardless of the slander and harassment that made its way around. My Hair Trip Salon is a beacon of light and a place to learn professionalism and healthy working relationships. My art aligns well with Nicole’s personal and business mission statements. Throughout the time I have been going to My Hair Trip Salon, I have found the value in supportive friends and how to build a community with those who share a similar vision. My Hair Trip supports so many local artist and artisans with love and positivity. Please consider their services next time you are treating yourself and your friends. You wont be disappointed! Its nearly been six months without my dear Sage and I adore every Catahoula Leopard Hound I see, plus she is still the wall paper on the lock screen of my phone. I adopted Sage in the summer of 2010. I found her on pet finder while visiting my family in Boulder. I had resisted getting a dog during my early 20s because I was in college and renting rooms, but I after 4 years of feeling that way and my boyfriend getting a dog, I wanted one of my own. I went to visit Sage at the Boulder Humane Society and regardless of my second and third choice picks, Sage was the one. She was off-standish and obviously heartbroken, pining for her family to come back and take her home. One of the volunteers saw my reluctance and explained he had taken her for hikes and she was a totally different dog outside of the Humane Society. I took her for a walk and he was right. She won my heart when I threw a rock into the creek behind the Humane Society, and like a dork, she dove head first to find it. I took her home for 50% off her adoption fee, coupons for Avoderm dog food, collar, leash, and bowls all for $100. The next day, Dad, Dave, Pete, and I took our dog pack: Loki, Blue, Hank, and Sage, for a high alpine hike up James Peak, just outside Rollinsville. Sage did so well off leash, she and I were bonded the second we left the Humane Society the day before. Mid August rolled around and it was time to drive home to Corvallis, Oregon to start school in the end of September 2010. My boyfriend at the time, Dave, had a dog named Loki he rescued from a craigslist ad. Loki was the bravest dog ever, kinda. She had never been socialized and was afraid of everything, like bridges! She just couldn’t cross them without being picked up and carried. Loki also had Thrombocytopenia, an autoimmune disease that would not allow her blood to clot. On our way home to Corvallis, Loki became super sick. We had taken her up a 14,000’ ft mountain, Castle Peak, with my Dad on our way out of Colorado. The whole trip to Corvallis, Loki was bleeding out of every opening in her body. We arrived in Oregon to our veterinarian at Albany Animal Hospital only to receive the bad news that Loki was dying. Dave was experimenting with a “money free” lifestyle and had been exchanging veternary care for labor on the farm the owner and head veterinarian, Ken Fletcher DVM, owned. Dr. Fletcher advised us we had two options: to put Loki down or provide her a blood transfusion and giver her more medicine to hopefully save her life. Dave and I decided on the latter option and Sage was the blood donor for Loki. We left our two girls at the vet that night and returned the next day. Loki was so weak, while Sage was lively and curious about her new home. I was so proud of Sagie that I bought and cooked her the nicest stake I could afford and despite being a vegetarian for 15 years. Having been fed well at the vet, Sage was not hungry but I forced the food on her anyways. She finally took a piece of stake and walked off with it. Promptly there after, Dave yelled down to me from our bedroom, “Grace! Your dog is the BEST dog ever!” I ran upstairs and Sage had taken the piece of stake and dropped it in front of Loki, hoping to help her recover. Just incredible! Sage was always like this – thoughtful, protective, and nurturing of all the animals she came to live with and raise. Unfortunately, Loki died that night. We buried her in a plot of land we would often take her on walks to. As time passed, her grave grows the darkest, richest, emerald green grass with an amazing view. Sage has so many stories, I could write endless blog posts about her and she will always resurface. As a rescue, she needed my constant attention and another dog to be present with her at all times, so we did everything together. When Dave and I split up and he took his dog Hank (Hank was Dave’s Dad’s dog who needed a home) Sage couldn’t be left alone, so I took her everywhere I went or found a suitable sitter if I absolutely couldn’t bring her with me. Working in Boulder, I could leave Sage with my family. Sage loved my folks new dog Dakota and Blue until he died at the sage of 14 in March 2013. I could leave her with my folks while I worked cleaning houses or landscaping for clients who wouldn’t let me bring her to the job site. Sage and Dakota (our second family dog and inspiration for the Dakota painting and leggings) went on countless hikes with Dad, Pete, and I. So many paintings and the foundation of my color pallet were discovered and inspired by these high alpine hikes. Sage made it to openings, First Fridays, gallery shifts, and helped me run the Denver Art Society as the Interim Executive Director. I met all the neighbors wherever we lived thanks to the daily walks Sage demanded to keep her territory dialed in. 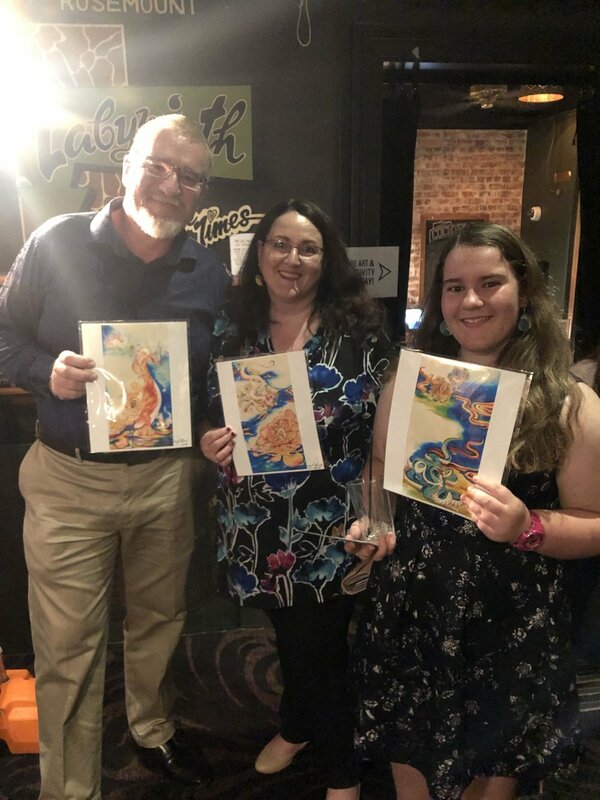 We started two small businesses: Everything Under the Sun Odd Jobs Service and Grace Noel Art, LLC. This date Jan 13, 2018, Sage turned 11 years young. Leading up to my birthday, March 19, Sage had some mild stomach problems of which I had taken her to the veternarian for. 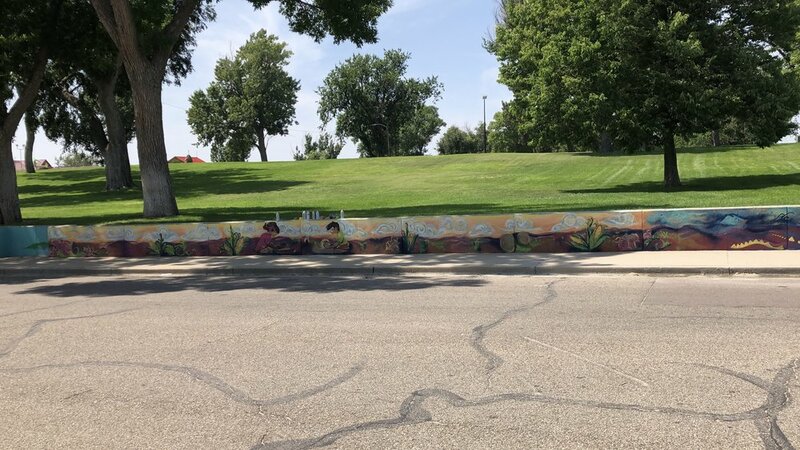 No one really knew what was up with her and figured it was from eating alley food behind the Denver Art Society or a soured bone from Mom and Dad’s back yard. Sage’s acupuncturist of 6 years had no idea either; Sage had received acupuncture per recommendation from Dr. Ken Fletcher to treat her urinary incontinence. Sage and I had been living in Boulder after moving out of the Denver Art Society in Jan 2018. Mom and Dad would take her for Sunday hikes and meet me for breakfast afterwards; I usually wanted to sleep in Sunday mornings since I usually had worked events Saturday nights and had been out late. The morning of Mar 24, 2018 I was meditating and planning to meet my parents for breakfast after their morning hike. Midway through my morning meditation, mom called me. I ignored the call and kept meditating, since my folks don’t always respect my “no-interruption rule” while meditating. By the third call I answered and mom was frantic, screaming: “Sage is dead! She died on the trail!” She was crying and apologizing, “I am so sorry Grace,” and just kept crying. Mom and Dad brought Sage home and I gave her all my love. I held her one last time and wrapped her body in a shroud with Shiva mantras all over it. I burned cleansing herbs, incense, and rang my meditation bowl saying mantra as tears rolled off my cheeks onto her deceased body. I put flowers all around her and drove her to the Gunbarrel Veterinarian to be cremated. No one knows what happened to Sage. That morning, my parents described her as running and chasing prairie dogs. She made it to the bottom of the mesa and seemed tired. Mom and Dad coached her to the top of the hill and when she crested, the view took her breath away and she died right there on the trail. I could not have asked for a better exit of my beloved, and that’s who Sage was. She was so nurturing and thoughtful, always staying focused on the big picture and leaving the details to figure themselves out. I am so grateful that I did not go through extreme life saving measures that would only end in pumping her body with enough poison to end her life. She died the way I would want any loved one to go, doing what they love. Coincidentally, Klondike, Leigh the Llama Lady’s dog, died the next day. Sage and Klondike had been friends 6 years and saw each other every week. Leigh and I had the fortune of grieving together. I have experienced many doggies transition from their bodies. As Sage was carried off to be cremated, her tail fell out of the cloth I had wrapped her in. I realized at that moment, who I loved was no longer in that body and that I was not attached to her at all. The experience was disorienting for both Sage and I. After a few days of grieving, I remembered my baba’s advice when dealing with death, “channel loved ones through the heart.” Every time I thought of Sage, I did just that and instantly felt reunited with her. The experience was so extraordinary, I gained a new appreciation for the light that is behind every living being’s eyes. I know now, “these bodies are like the cars we drive,” something baba always says. The part of us that truly matters, the spirit, the soul, the self, brings life to the body. The spirit occupies a body until it is time to transition to another reality. This is one of my big learning experiences of 2018 and Sage’s parting gift is a renewed appreciation for the spirit, the soul, the self. We are all made of sunshine. Sunshine makes the plants grow, the water flow, and the wind blow. So now it is time to go, on a magical journey through the rainbow. I am running an eARTh Day promotion! The first 3 prints of Expect Resistance of Expect Resistance sold by May 5 will be discounted to $50! The funds raised will then be donated to The Arts District on Santa Fe Nonprofit to help match the recent $10,000 grant from the Denver Arts and Venues, woo hoo! Thank you for your love and light! Went to Randoori yesterday at Easton's Boulder Gym. I kinked my neck somehow, seems to be the trend amongst fam and friend. When I got to the family brunch, my Auntie and Uncle were visiting from Denver, Auntie Vi just could not stop complaining about her neck and headache from being sick with a cold the last 3 weeks. Seems Chiron's last visit through Pisces brought out some deep wounds. I think my cousin Chris has felt it too - a neck ache so bad he bought a new bed, lol. Granted he was sleeping on my old futon mattress with a crater that could kill dinosaurs. Its time to get our heads on straight, do whats right for us I guess. This brings me back to Jiu Jitsu Sunday Apr 15. Ouch, me neck hurt from rolling. Still does today, Monday. However, the trade off is better posture, reinforcing my joints and activating under resourced muscles. How? using all those resources makes the neck ache duller! Oh yes the pain is still there, and Pneuma Chiropractic will happen 1:40 pm Earth Day, followed by massage Apr 27 1:30 pm with Zap Zing Body Works. Daily icing, topical analgesic, and restorative yoga as maintenance. Jan 3, 2017 was a game changer though, I loved my first class so much, I kept training. Yes, I still have that resistance to attending class, its a scary and strange activity to voluntarily go do with people. The benefits out way the anxiety and I've built a community who cares about me and my training. Since I began training, I am a calmer, more relaxed person and have come to grips with my sense of fear. My consciousness has expanded by way of better reflexes, clear mind, and patience. In some ways I am more bold and feel like a super hero even though I am just a four stripe white belt. Ultimately my training has taught something most would find counter intuitive: aggression and will power will only get you in trouble. Jiu Jitsu is a matter of strategy and a dance between two opposing energies. The art? Go with the flow, slow is smooth, smooth is fast. I look forward to training with you some day, since I am not just an artist, but also a martial artist. Always go to jiu jitsu. There's a terrible longing in my daily actions for NYC. Living in Brooklyn, training at the Renzo Gracie Academy, all the Unicorns? Its just that, all the Unicorns. Denver is full of them for sure, just NYC has more of them! I liked the crowds, bold speech, and fast pace from one thing to the next. See, that's just it... Where is everybody in NYC going? And why so fast?? All these unicorns are galloping too and fro, on their own time? I don't know... We're all working for ourselves, so watch how our light surfaces and glows. No one's there to drag us down, so its time to go, I guess. This is mostly insight for myself, since many of you were right, "you're going to NYC? You'll fit right in!" On the airplane ride home, I read Faith Stone's Rudi and the Green Apple, cover to cover, surprisingly for this slow reader! The story had all my favorite characters, descriptions of incredible Hindu and Buddhist art, and took place in Manhattan and Rudi grew up in Brooklyn. The book was a perfect ending for my recent trip to NYC. Why though? Well a theme powerful for me was loving the self amongst all the energies that distract us and dampen our light. Persuading a horizontal exchange of energy, rather than vertical can leave one depleted, constantly reaching for more light externally, instead of internally. Faith suggested (paraphrasing) to imagine a delicious fruit in your chest, where your heart is. Every time you think of that fruit, a ripe papaya with lime after surfing in Kauai is what I chose, it reminds you life is to be enjoyed and your juicy sweetness comes from inside. What is inside becomes outside and without it, the body dies. So when I look into your eyes, I see the light that resides. Its good to be home, NYC can't resist me and all I have to offer so I know I will be back to Brooklyn soon. Meanwhile, I am supported and loved by my colleagues in Denver and Boulder. There is much to do busy with the Art District on Santa Fe Dr, a demo at the Denver Art Museum first two weeks in July 2018. Spectra's 420 show install... pause... one shout out to Spectra: I have the best experiences there! Such a great vibe, crew, and they have great taste in art! Oh and Pancakes and Booze was wonderful to see familiar faces and meet new ones. As you can see, I'm a very busy Unicorn galloping from one place to the next. Thanks for reading and being part of my adventures through the Rainbow. Back to Denver after two weeks of adventures through the NYC art scene. My art stimuli are blown open wide and my vision much broader and slightly exclusive after NY. Definitely savoring the experience and hungry for more. Denver and Boulder are home however, and tonight is Pancakes and Booze Denver, 8 pm - 2 am, Cervantes Masterpiece Ballroom. See you there right?! Waiting in the April sunshine made me glow like a gnome happy to be home. P&B brings together so many artists from not just Colorado, but I've met Unicorns from Utah, Kansas, Nebraska, and Montana. Its going to be a wonderful spring evening with free pancakes and toppings washed down with drinks and an affordable door price of $10! After install I had a lovely brunch at the Mercury Cafe, a Denver Institution! My craving for Eggs Benedict had carried over from Thursday morning in Williamsburg. Thankfully, the Mercury cafe's delicious hollandaise sauce quenched my craving. Creamy and thick with homemade hot sauce. On my way out, the door had my favorite poster about How to Build Community surrounded by the vibrant souls who have passed through the cafe. Next to it was another poster I hadn't seen before: How to Build a Global Community. Just so beautiful to have the two posters side by side met by barrels of spring flowers as the door opened to the sidewalk. 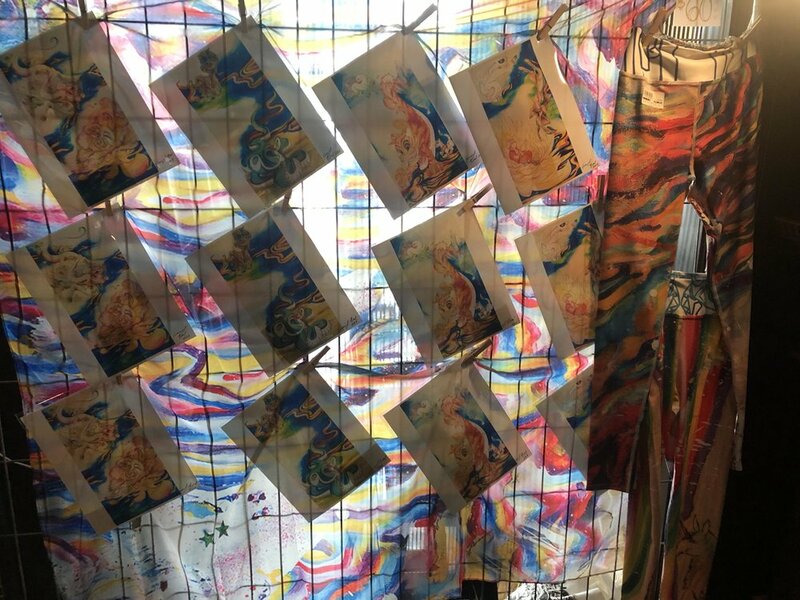 The Denver Art Society is an entirely volunteer run Arts Education Nonprofit that was established in 2009 in the La Alma neighborhood. The La Alma Neighborhood includes Denver's culturally most diverse area for many decades with a large immigrant population. The Denver Art Society (DAS) brings together a multitude of membership from all economic, social, and political backgrounds. We provide a venue for a diverse group of artists to use as performance, teaching, and display space while volunteering in the Denver Community. 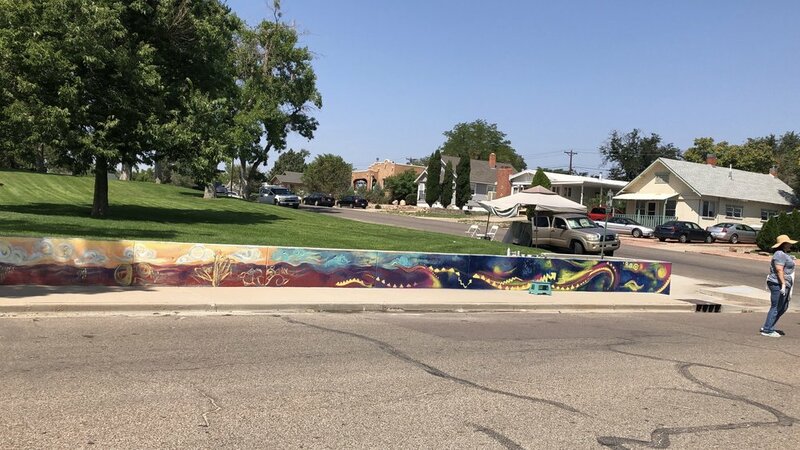 An influential project of the Denver Art Society has been the monthly Alley Rallies, which turns cleaning up the alley and gallery into a community event. Alley Rallies are all day events one Saturday per month where local visual and performance artists attend to paint murals, perform music, and collaborate on beautifying the alley behind the Denver Art Society. All artists and residents of the neighborhood help pay for the cost of trash removal and volunteer their labor for clean up. As a member of the Denver Art Society for four years, Grace has been on the Steering Committee from 2014-2017 and was recently appointed to the interim Board of Directors Jan 2017. She has been an activist in Colorado and Oregon for mental health, sustainable/affordable food and housing, and art for over a decade. Equal representation and access to the arts is Grace's passion and she spends nearly every day working towards building community through art.